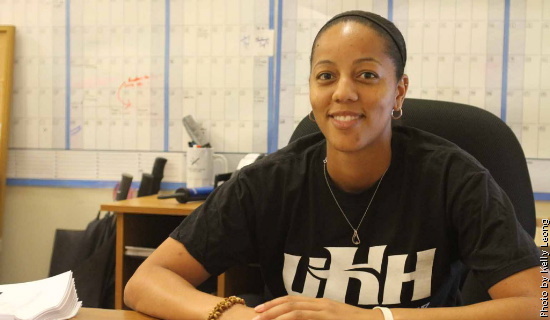 Vulcan Press Release: University of Hawaii at Hilo Athletic Director Dexter Irvin today announced the selection of Unity Beddingfield as the women’s soccer coach, effective April 16, 2012. Beddingfield takes over the UH Hilo program after a year as the assistant coach at San Bernardino Valley College where the team finished 15-6-3. Six months earlier she was an assistant coach of former UH Hilo and current California State University San Bernardino Head Coach Travis Clarke. “She works very hard on-and-off the field, is a great leader and mentor to younger student athletes,” said Clarke. “She is a driven young woman and stepped up to any challenge I have seen in front of her as a player, student, person and coach. The Vulcans finished the 2011 season 5-9-2 overall and seventh in the Pacific West Conference at 3-7-2 with a roster that included two seniors, four juniors, six sophomores and 15 freshmen. “This is the biggest step I’ve taken and a great opportunity in a great atmosphere,” said Beddingfield. “I’m hoping to bring a different dynamic and atmosphere to help the program grow. Beddingfield, a 2011 graduate of CSU San Bernardino, has played soccer for over 21 years. She was a two-year starting forward for the Coyotes before joining the Claremont Stars of the Women’s Premier Soccer League. Beddingfield hoped to take her talents overseas before a career-ending injury derailed her efforts. Fitness remains a crucial point in her life. With her bachelors in Kinesiology and Exercise Science/Pedagogy, Beddingfield is a certified personal trainer. Douglas Curran scored on back-to-back headers in the fifth and ninth minutes as Mililani defeated Kalani, 3-0, to win the 39th Annual Outrigger Hotels & Resorts/Hawai’i High School Athletic Association Division I Boys Soccer State Championship. It is the OIA’s first state title since 2004, when Mililani won its fourth in a row. This was the first all-OIA state final since 2001, when Kaimuki defeated Moanalua. Below is the official box score. Goals: Douglas Curran, 5th minute; Curran, 9th minute; Ryan Tokunaga, 37th minute. Goals: Jesse George (Kapolei), 11th minute; Kelle Miyama (‘Iolani), 80th minute. Goals: Alex Lam (Punahou), 8th minute; Andrew Miscovich (Punahou), 31st minute; George Giogiev (Pearl City), 38th minute; Don Park (Punahou), 60th minute; Quincy Marting (Punahou), 75th minute. Goals: Tayler Sonobe-Morita (‘Aiea), 25th minute; Ezra White (‘Aiea), 29th minute; Cameron Boucher (Waiakea), 36th minute; Brooks Tanonaka (‘Aiea), 55th minute. Division II Honoka’a defeated Kapa’a, 1-0, to win its second straight Outrigger Hotels & Resorts/Hawai’i High School Athletic Association Division II Boys Soccer State Championship at Waipi’o Peninsula Soccer Stadium. Goals: Sequoya Kerr (Christian Liberty), 24th minute; Stirling Aponte (Mid-Pacific), 68th minute; Zach Wolf (Christian Liberty), 71st minute. CASTLE (7-9) 1 0 — 1 Goals: Darin Shichida, 1st minute. Goals: Keo Ponce (Kapolei), 50th minute; Kazuto Moribe (Kalani), 59th minute; Leo Klink (Kalani), 87th minute. Goals: George Georgiev, 52nd minute; Eddie Rodriguez, 58th minute. Goals: Mattias Thompson (Baldwin), 10th minute; Quintin Love (Punahou), 20th minute; Thompson (Baldwin), 26th minute; Taylor Peter-Bibb (Punahou), 38th minute; Keelan Ewaliko (Baldwin), 40th minute; Blaine Granger (Punahou), 53rd minute; Love (Punahou), 68th minute; Ka‘imi Fairbairn (Punahou), 80th minute. Goals: John Hyland (Mid-Pacific), 25th minute; Justin Warren (Honoka‘a), 52nd minute; Warren (Honoka‘a) 60th minute; Valentino Quijano-Moeckel (Honoka‘a), 74th minute; Robert Connors (Honoka‘a), 77th minute; Dylan Shiraki (Honoka‘a), 80th minute. Goal: Trevor McCracken, 35th minute. CASTLE (6-9) 1 0 – 1 Goal: Kyle Urasaki, 17th minute. Goals: Elijah Lingendfelder (Makua Lani), 8th minute; Gabriel Pinheiro-Alves (Kahuku), 10th minute; Kekahu Aluli (Kahuku), 45th minute; Aluli (Kahuku), 56th minute.